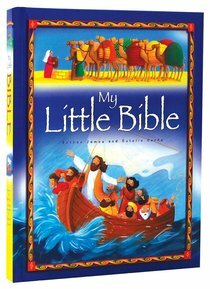 This small, padded hardback features 33 Bible stories (22 OT and 11 NT), retold simply and faithfully by much loved children's author, Bethan James. Ages 4-7. Bethan James is a former teacher and youth worker. Bethan has written a number of books for children, and lives in the south of England with her husband and children. After a career that began in advertising, magazine and package illustration, Estelle Corke has found her natural calling in children's book illustration. She is a traditional artist who uses real paints including gouache and watercolour in a bright and bold way. Estelle is based in the west of England where she lives with her husband and young daughter.